I start every semester with the same mindset – I’m gonna do all of my homework and read every each of my assignments in a timely, organized manner. 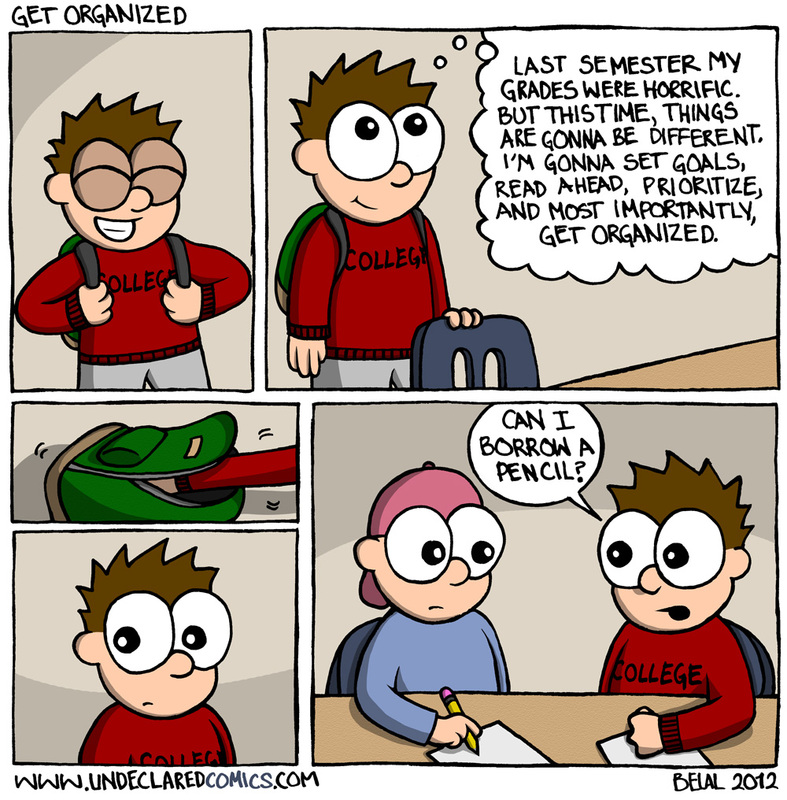 Of course, this approach never pans out and by the first week I’m behind in all my classes. At this point, I go ahead and give up – its inevitable. Its a completely false ideology – from my personal experience, studying is significantly more effective when done in a state of delayed unorganized chaos. I’m pretty much the same way. Haven’t started the semester yet but I have to read a lot of books and I know I’m going to be behind all the time. Haven’t started semester yet, start on the 17th. But I have that same mindset + no facebook, let us see how long that lasts. No Facebook? You’ve got no chance. haha, well i’m the other guy in this comic. I was always the one who was giving out a pen. Just curios, what program are you using for you comics? Sketchbook? Yup! I hand draw and ink every comic. I scan em. Then I color em using Sketchbook Pro. SBP is pretty sweet. I use Photoshop for some stuff too.